Some of y’all know, I am a fan of bubble baths. So I thought I would take the opportunity of sharing my tips for a successful spa day at home. First, make sure no one is about to run the dishwasher or the washing machine. Cold water is not your friend. Unless it’s 113* F outside, and only if the cold water has fermented hops in it. Second, choose the aromatherapy. You can opt for bubble bath, bath oil, candles, whatever makes you feel happy. Be advised that bubbles hinder you when reading, oil makes the tub slippery, and candles can be hazardous to long hair. All three together is only going to end in tears and fried hair. Third, secure the premises. Sure, locking the front and back doors is fine, but I am talking about securing the bath from pets and kidlets. Nothing more distracting than having to fight your sheltie for bathtub acreage while a kid is asking to help bathe the four-legged sister. Fourth, keep your robe and towel handy. Nothing worse than taking a hot bath while slathered in a facial mask, only to find that your towel is nowhere near, and your eyes are shut from the sweat having melted the mask down your eyebrows, making you trip out of the tub and faceplant on the carpet. 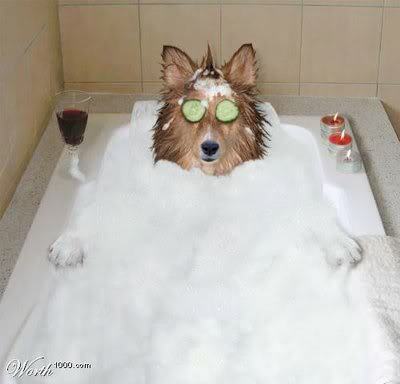 Fifth, and most important, do not take a single glass of wine into the tub. Bring the bottle. You will find that time really does stand still and there is only so much reading of a crappy novel before you want to drown away the bad taste of some idiotic damsel in distress over a broken nail. Bonus: it helps drown out loud pets, loud kidlets, and loud hubby. This entry was posted on Monday, April 7th, 2014 at 11:29 AM	and tagged with innocent-fun, live-like-you're-dying, ZOMG!! and posted in Fun Stuff, Funnies, Vanity Bonfire. You can follow any responses to this entry through the RSS 2.0 feed. Because it’s early in the day for me, I read this as how to have a Spad experience. Why you were into antique aircraft was beyond me. What, no music? I thought you’d need some tunes for your aquatic decompression.